Don't look now but Lenovo has just introduced a $99 Android tablet into the US market. It's the Medion LifeTab E7312. Medion, a gadget maker based in Germany, has been selling PCs, ebook readers, and other gadgetry via Aldi stores for the decade since I first heard about them. This firm was bought by Lenovo in 2011 and has continued to churn out budget electronics like they have been manufacturing for the past 30 years. 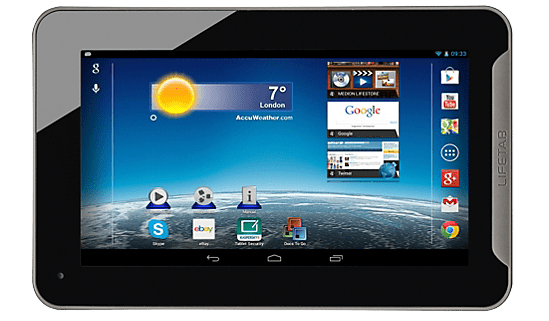 Medion's deals with Aldi means that the LifeTab E7312 is probably the most widely available of all the budget Android tablets on the market. It has shown up in Aldi stores in the UK, US, and Germany, but is it any good? The Medion LifeTab E7312 runs Android 4.2 Jelly Bean on a dual-core 1.4GHz CPU with 1GB RAM, 8GB of storage, Bluetooth, Wifi, and a g-sensor. It has a 7" screen with a resolution of 1024 x 600, and to the bottom left of the screen you'll find a VGA webcam. This is not your Average Android Tablet. While most $99 tablets offer a one piece shell with a black glass front, the E7312 has the expected black front (with a piece of gray trim accent to one side) and anh an aluminum rear. The backside also has a 1" gray trim which feels like rubberized plastic. The combination of the aluminum and gray trim offer an unusual tactile and visual experience that is much more pleasant that with most tablets in this price range. I'm not saying that this tablet is built of higher quality materials than other $99 tablets, just that it looks nice enough that you probably won't mind. You'll find the solitary speaker on the rear of the tablet along with the 2MP camera. The power and volume buttons are on the bottom edge of the tablet, and on the left edge are the ports and microSD card slot. This tablet feels nice and looks pretty, but I just can't get past the placement of the buttons and the cameras. As you cans see in the official product images Medion has decided that users should hold this tablet upside down. Apparently they did not realize why that was a bad idea. The placement of the buttons annoys me to no end, and since I know that there are better tablets on the market I say buy something else. With an Antutu benchmark of 13,914, the LifeTab E7312 falls in the upper end of the dual-core Android tablets I have tried. For the most part this tablet has decent performance. I tested this tablet alongside my Sero 7 Pro, and while I could see that the more expensive tablet was more responsive the difference was negligible. The touchscreen was uniformly responsive, and I found it easy to use the on screen keyboard or play games. But web browsing, now that's another matter. The LifeTab E7312 had trouble accessing my Wifi network, and when it was connected the download speed was rather slow. Also, browsing the web in Chrome (on this tablet) was a miserable experience; it was so bad that I switched to the basic web browser that comes bundled in Android. That browsing experience was not good, but it was slightly less sucky. This tablet ships with a Youtube app as well as a custom media app, so you won't be stuck with the stock Android media player. I of course used the media player to test the battery, and I also watched videos on Youtube. Both apps worked well. The solitary rear speaker was quite loud even when laid on a soft surface, which is unusual for such a cheap tablet. The audio quality was about the same as other budget tablets I've reviewed. The screen, now that's another matter. Screens are often one of the most visible ways that a tablet maker can cut corners and reduce costs. Sometimes the colors on the screen are washed out (the Ematic em63), or have obvious screen defects like the EGQ307, and sometimes the tablet maker will choose a lower resolution screen (ClicknKids Tablet). The screen on this tablet, fortunately, shows a couple flaws but it is as good as one can expect from a budget tablet. The LifeTab E7312 has a 7" screen with a resolution of 1,024 x 600. The color quality is good, and not washed out like on the Em63. The frontlight can get quite dim (in comparison to my Hisense Sero 7 Pro) but it cannot get as bright as that $149 tablet. Also, the colors on the LifeTab E7312 don't look as strong as on the Sero 7 Pro, but that is to be expected with a cheaper tablet. The horizontal field of view is quite wide; there's some drop off in color quality but the images are still recognizable. The vertical viewing angle is another matte - this field of view is skewed. Working with the reference point of the volume and power buttons being on the top edge of the tablet, rotating the tablet down causes a near immediate loss of color quality. But if you rotate the tablet up (so the buttons are turned away from you) you will not see a similar drop in quality. I find it a little odd that the screen would have such a skewed field of view, and I think it's worth noting that this issue will be most visible when holding this tablet in portrait mode. The E7312 runs a stock install of Android 4.2 Jelly Bean and comes with Google Play, which is good, but it also comes with a lot of bloatware, which is not good. In addition to Google's bloatware (everything from Hangouts to Play Music/Books/ Newsstand/Games), this tablet also ships with several retail apps from Aldi, an Ebay app, Kaspersky security, Skype, DocsToGo, and more. As a result of the bloatware the E7312 has even less storage than your average budget tablet (about 3.6GB), but on the upside the bloatware does include a decent media player, a couple ebook apps (Nook and Google Play Books), an office suite, and Youtube. I've installed a couple basic apps (Kindle, Aldiko, Angry Birds) as well as the apps which I use to test the tablet (Antutu, ES File Explorer, etc). I did not have any issues. I had high hopes for the cameras on the E7312, and aside from a few caveats I am impressed. This tablet is equipped with a VGA webcam and a 2MP rear camera. Both are fairly good quality given the price of this tablet. The VGA webcam is low resolution and somewhat fuzzy, but it is as good as most of the cameras I have seen on budget tablets. It should be able to show a recognizably image when video chatting (assuming you are in a well-lighted room). Now, the 2MP rearcam was truly a surprise. I was truly not expecting it to be capable of creating a sharp 2MP image. The sensor in this camera is better than I could have expected. But it's not perfect. The rearcam lacks any image stabilization found in better cameras. If you move it too quickly the image gets wavy. It's almost as if the sensor isn't capable of scanning as fast as the camera is moving. Luckily, that is a relatively minor issue. If you hold the tablet steady while taking the picture you should be okay. It's only if you try to record an action shot while moving the camera that you might have an issue. As you can see in the following photographs, the rear camera worked well outside on an overcast day in December. The photo of my dog unfortunately did not come out as well because there wasn't enough light in the room. This is the one area that knocked this tablet out of the running for best value under $100. While the E7312 might look good and run smoothly, the battery life was disappointing. The E7312 has both a limited runtime and limited bystander time. It tended to die after barely than 2 days standby, This is not that big of a problem, but it does tell us that the battery quality is lacking. Then again, I suppose the short battery life already made that clear. After several tests, I would estimate that the E7312 has a battery life of under 3 hours. To be more exact, I ran a video for an hour (with the screen at full brightness and Wifi on) and the test consumed 40% of a full battery. This might not suit everyone but it is my standard battery test. It lets me apply the same measuring stick to all of the tablets I test. That includes several tablets that have an estimated battery life of 5 hours or more. The HP Mesquite and the Hisense Sero 7 Pro both have an estimated 5 hours of battery life. And the HP Mesquite costs $99, too. I wanted to like the LifeTab E7312, I really did. It's hands down the prettiest of the sub-$100 Android tablets I have tried, has a decent build quality, and feels nice in my hands. But it's frankly not all that great of a tablet. It has a decent performance but a disappointing battery life of less than 3 hours. And while the 2MP rearcam is of a much higher quality than what you would find on most tablets in this price range, it's terrible at handling motion; the slightest twitch throws the image out of sharpness and distorts it. And to top matters off, the software is replete with bloatware and is configured incorrectly. I discovered while trying to play Angry Birds that the default direction on this tablet places the power and volume buttons on the bottom edge. There are some games (like Angry birds) are going to insist that they can only be played if the tablet is held upside down, putting it at risk of accidentally being turned off. If this issues don't bother you then this is the tablet for you. But if you value battery life and a lack of bloatware then I would recommend the HP Mesquite Android tablet, which retails for $99. This isn’t something I can trouble shoot long distance, sorry. finally a decent review of this tablet! this was an impulse item purchase in the checkout line at the local Aldi down here on the Gulf of Mexico… by bloatware, i assume you mean ROM’d in the firmware? can’t be deleted? that would be unfortunate… perhaps there’s a ‘droid distro that could be reflashed on this beastie? One thing I’ve learned in the year since I posted this review is that the apps aren’t locked in to a cheap tablet’s firmware quite as thoroughly as with say a Verizon branded smartphone. The excess apps can probably be deleted, but it is still a pain in the but. it’s not the E7312 – it’s the E7232!!! picked on up here at an Aldi’s in Florida – otherwise specs are the same – and was able to delete the bloatware and crapola from the ‘droid system with ease – battery life is abysmal, but what do you want for less than a Franklin? I created an excess of home screens but I have app icons on just two home screens. I tried “pinching” the screen with my fingers, as its normally done with Samsung devices, so that I can delete the home screens I don’t want but it turns out not to work with Medion lifetab 10″. Does anyone have an idea how to remove unwanted home screens on this tablet? I’m not sure which Lifetab 10″ you have o what software it’s running, but what I would try next would be to press and hold on the home screen background. With some tablets this will bring up an option to edit all of the various home screens. It’s the Medion Lifetab E10320 running Andriod 4.2. I tried pressing and holding the home screen background, but it only provides options to change home screen wallpaper! I’m having trouble finding an answer online, but I do have an alternate proposal. 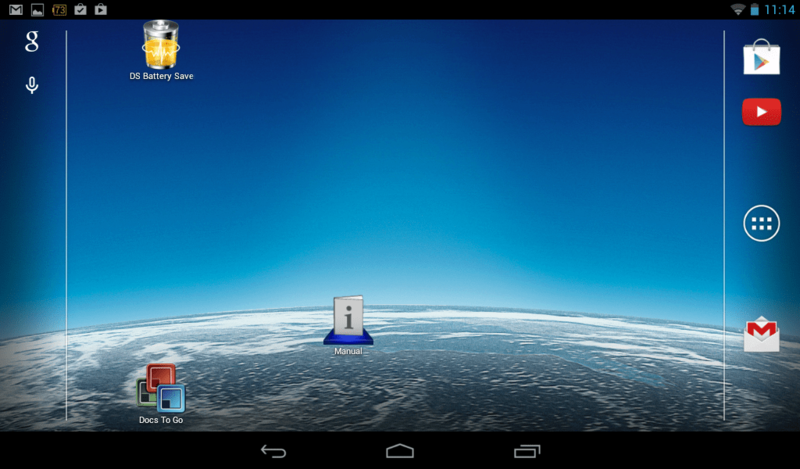 You could try installing a different home screen from Google Play. They’re called launchers, and there are dozens of free ones. Once you find one you like you can set it as default and simply ignore the current launcher. Hi thanks a lot for the help. I downloaded the dodol launcher and looks real cool. Your IP address suggests that you’re in the US, which means you can’t call on the warranty options available in Europe. You’ll need to contact Medion. It took me a while but I think I found their website: http://www.medion.com/us/. I am having the same problem with Skype …. any ideas what to do? je possède life tab E7312 MEDION mais son afficheur s’est casse par negligence. Est que ce que je peux trouver quelqu’un / une qui peut me l’envoyer gratuitement puisque je suis un étudiant et merci infiniment.